A highlight from the film this game is based on is when the characters realize that expecting everything to be ‘awesome’ is unrealistic. It’s a good statement for life in general, but shouldn’t we expect our games to be awesome, even if our jobs, relationships and bank accounts will never be? Luckily, we don’t have to worry about this philosophical pondering because The LEGO Movie 2 Videogame is actually pretty awesome. We all know Lego games by now. Players explore Lego reincarnations of famous franchises, destroy more or less everything that is stuck down, and move on. There’s a billion or so collectibles to find, mostly harmless bosses to fight, and plenty of childish jokes to pretend you’re too mature for. The LEGO Movie 2 Videogame is all of those things. It features all the landmark moments and sets of the film, slightly reimagined to give the players a little more to punch and build. But it has more to offer than that. The LEGO Movie 2 Videogame seeks to change things up, tweaking the foundations of the Lego game format to make something that has a little bit more depth beyond its family-friendly punch up. Most notably this is the building mechanics. Whereas nearly every Lego let you destroy things, few let you build them. Well, that isn’t quite true. Lego games would often have ‘puzzles’ where players had to destroy literally everything around them before rebuilding it into something useful. That mechanic is gone. Now players find blueprints to basic structures and tools that they can build anywhere, as long as they have the easily filled requirements. These builds have simple, instantly recognizable benefits for the player: the trampoline lets you get up higher, the generator powers electrical equipment, and the sprinkler puts out fires. Kids should easily be able to work out what each new blueprint can be used for, and have fun experimenting with them as well. The second biggest difference in the relics. These items are found in chest scattered around the world, and come in four flavors: tool, character, structure and mega. Taking these relics to the local shops allows you to open them and unlock the goodies inside. As before this is incredibly intuitive when you’re playing, so a kid of any reasonable age should be able to unlock and enjoy the benefits inside. At first glance, it looks like these might have been inspired about loot boxes, but thankfully there is no way to purchase them with real money. These include new items to equip, most of which are amusing if not useful, new characters which is one of the biggest highlights of The LEGO Movie 2 Videogame, and new vehicles and buildings, which we’ll get to later. If you saw a character in the film that you liked, chances are you’ll be able to play them in the game as well. My personal favorite was a character dressed as a giraffe for some reason, who I think is collectively in the film for a handful of seconds. The film is so fun of whimsical, surprising characters and it’s great to see so many of them translated into playable characters. The vehicles, on the other hand, are a different matter. While they again come in the many shapes and sizes that you’ve seen in the film, I found them nothing but frustrating and awkward. Several side quests in the game involve in racing and nearly all of them provide a vehicle of some sort to compete with, but it is nearly always faster and easier to run the course on foot. Vehicles get caught on nearly every step in the game which is annoying when every slope is made of tiny steps, and they aren’t even any faster than running anyway. I honestly can’t think why the vehicles have no speed behind them but it makes using them to explore exhausting, even if you are having fun. And it would be great if they were a little quicker and easier to use as well. The maps in Lego Movie 2 Game are much bigger and more open than previous games as well. For the first time in the series, the game really has an open world feel, even though other LEGO games have attempted it before. Each location is so filled with character and characters that it gives you much more satisfaction for roaming around. Not much has changed into the core gameplay from previous games though, even the side quests are simply platforming sections or fighting arenas, but they’re nice and uncomplicated. 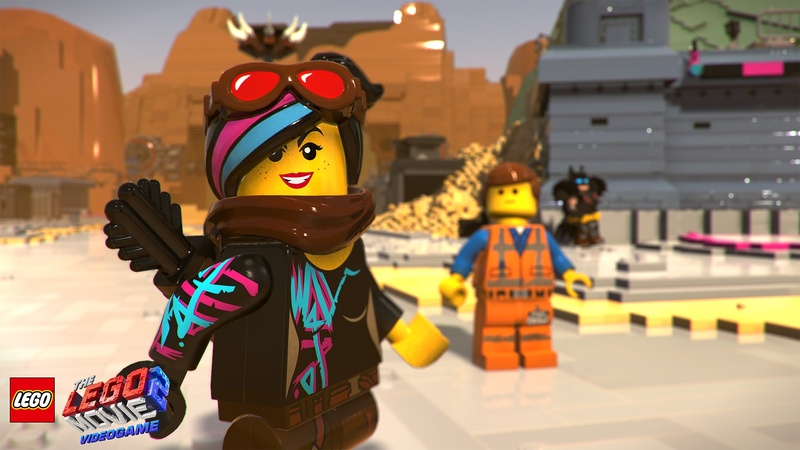 Finally, the Lego Movie 2 Game has taken a bit of inspiration from Lego Worlds. Lego Worlds was perhaps the most Lego game ever, which allowed players to build their own Lego wonders one brick at a time. Lego Movie isn’t quite so precise, but it does give you a fairly large space to build your own town. This is where the structure relics come into play, as they give you blueprints for different buildings you can add to your metropolis. You can’t build anything yourself, but the variety of buildings you can find, plus where you place them means that every town will have its own unique look by the end. This whole section is also completely avoidable if you aren’t interested in plastic city planning.